Triathlon has evolved into many distances and formats since its creation, but one of the biggest challenges has always been the ability to run fast off the bike. Considering the run is the finishing segment, its importance cannot be relegated to simply an equal to the swim and bike. I know this will raise alarm bells for some triathletes and coaches, but the fact is we all run across the finish line. My experience as an athlete covered the full spectrum of formats from age group sprint races to Olympic drafting legal events, and through that experience I have formulated three key methods to running faster off the bike. These methods will improve your run without sacrificing your cycling or swim training by adjusting your training schedule, specificity of training, and race simulation workouts. The first step to improving your run is to plan your training schedule in the order you race. I plan most training days in a swim, bike, and run orientation. Swimming is the easiest sport for most athletes to get done in the morning regardless of being a professional or age-grouper. Schedule demands may affect an athlete’s ability to ride and then run on the same day, but for most athletes, the need to ride during daylight make it easy to complete the day with the bike and then a run. The order of training in a day is important because it requires the discipline of specific muscle groups to adjust as they do in competition. Training for the run forces the athlete to adapt to running on tired legs. 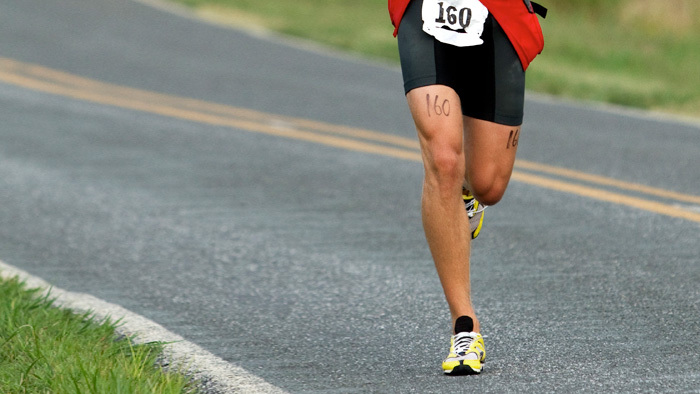 Muscle groups will develop the ability to transition from swim to bike to run. There is also a mental side to training in order that benefits run training. If an athlete consistently measures their progress while running at the end of the day they can evaluate their true preparedness for competition. The pacing and perceived effort developed from running at the start of the day can be detrimental to race performance. I do make exceptions to this rule to accommodate specificity training. My definition of specificity training is a session that focuses on improving the racing performance of an individual discipline. For running, this includes planning a day in the week when the athlete is recovered and can complete the running session prior to other sessions. Typically this is a maximum intensity hill workout or speed interval workout. I believe that in order to run fast you must train like a runner to specifically raise the level of performance. Ironically, I think the bike specificity workout is another opportunity to improve your run. Adding a 10 to 15 minute run following your high intensity bike workout can provide race simulated fatigue to physically and mentally prepare for running off the bike. For most athletes this will be the Saturday or Sunday morning ride with the local cycling club. I always enjoyed the look on cyclists’ faces when I rolled into the parking lot, opened my trunk and pulled out my running shoes to get in a 10 to 15 minute run. My legs may have been exhausted but just running long enough to transition from cycling to running muscle group activation paid dividends in races. Brick training is the best race simulation workout to improve your ability to run off the bike. Whether including all three disciplines or just the cycling and running in a single session, one rule must be followed; race conditions must be simulated in detail. To set up an effective brick session take the time to designate a mount/dismount line, create a bike rack, and use the recovery between intervals to set up the transition area just as you would in a race each cycle. I specifically use my racing shoes during bricks to make sure that I have the laces adjusted properly and the shoes provided the need support or cushioning necessary to run my best. Personally, I chose a marathon, or mid-weight racing shoe because I feel the extra cushioning and support overcame muscle fatigue and stability issues form the cycling effort. I like to break down the race distance equally among the disciplines trained. For example, the breakdown for an Olympic distance brick workout may be a 300m swim, 8km cycle and 2km run. As a coach, I normally use swim/bike/run bricks for less experienced athletes to review their transitions and overcome any concerns they have preparing for a race. I plan bike/run bricks which follow yearly training cycles by increasing in intensity and decreasing in volume while training towards a goal event. Success running off the bike does not have to compromise your performance in swimming or cycling, but it does require a plan and specialized training sessions. Coaching and training have advanced, as a result the ability to win solely based on swim or bike performance has decreased, making a fast run necessary to be competitive at every level of triathlon. No matter what format or distance, I believe the best triathlete wins.